Before I hit the scale for my weigh-in this morning, I was feeling really confident. The past week I had eaten right and not gone over any of my points, exercised five days at the gym and even added in weight training three of those days. Imagine my surprise when the scale flatly stated that I’d gained two pounds. HOW? It was time to sit-down and rethink my week before I let myself get down about a defeat. The first thing to analyze is eating habits. True, I had eaten all of my Weight Watchers POINTs each day, however there were at least two days that I did not eat my daily allowance of POINTs. Another thing that was different about my eating this week was the fact I ate more sugar in the form of chocolate. Daily. Sure, I counted the POINTs within my daily intake, but for a month I had eaten sugar very sparingly and I imagine this was a shock to my system. Another thing I ate more of this week was carbs in the form of pastas and breads. I’d been cutting down on “white carbs” and only eating whole-wheat forms of carbs. The second piece of the puzzle is exercise. My cardio routine is rock-solid. Each day at the gym I use the Weight Loss program on the elliptical trainer followed by a 5 minute cool-down. The only variation this week was adding in a few days of weight training. I think that after doing the same exercise for over a month, I may be hitting a plateau due to muscle memory, which is your body getting too used to an exercise, much like knowing how to walk the same route by heart with your eyes closed every single day. So what’s the solution to make sure next week I have a more positive weigh-in? Eat Smarter – less sugar, less white carbs, follow the Weight Watchers Healthy Guidelines more closely. Exercise differently – going to try using the treadmill instead of the elliptical, and vary the intensity every other day. Third, listen to different music while working out. I have acute Gaga Overdose. 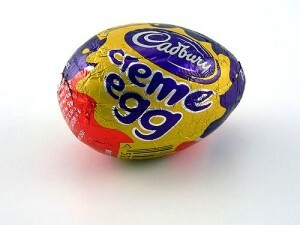 Lastly, in addition to not eating out in according to my Lenten deprivation, I MUST avoid Cadbury Creme Eggs. ‘Tis the season. I think it’s great that you were able to figure out the problems by paying attention to the changes in your diet. This is why tracking is so important. Good luck staying off the egg wagon. Those things are ridic. I bought 2 for myself on the weekend and I am going to try to make those my only eggs of the season. I ate one already though… lol. DAMN THEM! I picked one up while on line in Wal-Mart on Saturday. It sat in the cart for a minute until I snapped out of it and put it back into the egg-bin. DAMN THOSE sweet little morsels.